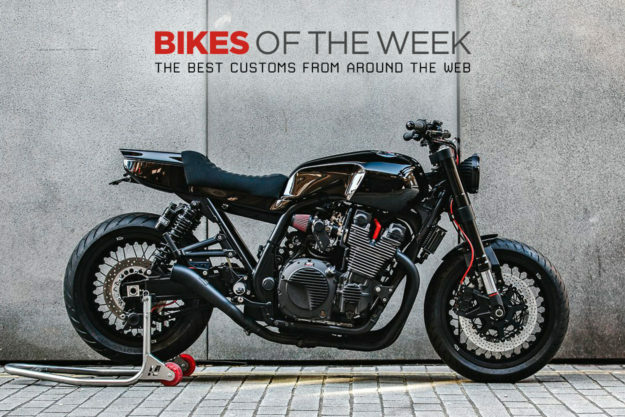 A sinister Yamaha XJR1300, a smokin’ hot RD350, a Honda CX500 with R6 suspension, and an 80s-style Hayabusa rocketship. It’s all about the grunt this week. 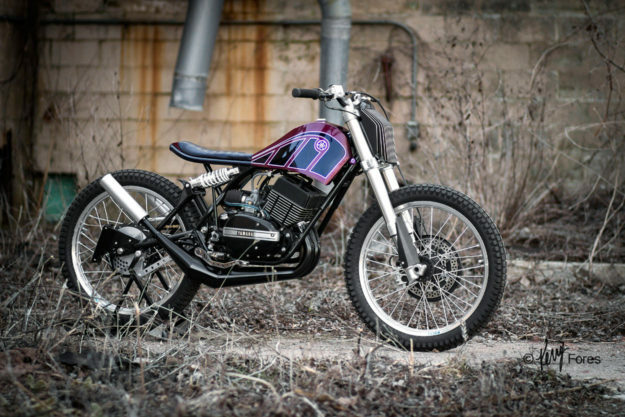 Yamaha RD350 by Jake Drummond Working from drawings that he’d penned about a year earlier, 24-year-old Jake Drummond wanted a custom that dipped toes in both the board tracker and mountain bike ponds. 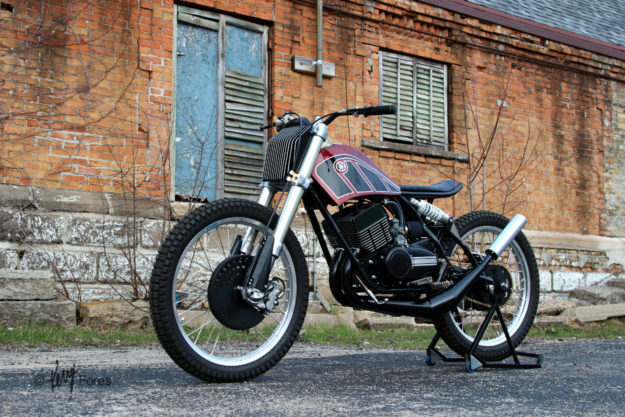 After two years of labor and learning on the fly, he’s done more than succeed with his Yamaha RD350. Jake didn’t even know how to weld properly when things got underway, so instead of blasting towards a finish line, he took his time. Barely anything, aside from the engine cradle has been left stock. The subframe is an all-new unit, designed to work with the modified swingarm that holds the 21-inch rear hoop and provide a mount for the twin inboard shocks. The steering head has been completely re-worked, and the lines on that custom tank earn Jake near-Golden Arm status. 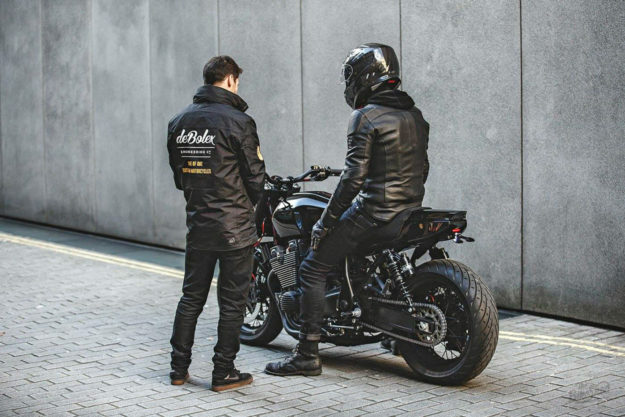 Yamaha XJR1300 by deBolex Engineering Last year I found myself on a ferry ride to the Isle of Man to take in the action of racing’s most amazing spectacle. And thanks to a friend, there was a Yamaha XJR1300 in the belly of that boat for me to flog around Snaefell during my stay. But as thankful as I am, my loaner sure as hell didn’t look anything like this stunner from deBolex Engineering. This bike belongs to Gareth Roberts, the man behind the eagerly awaited upcoming moto documentary Oil in the Blood. And while the job started out as a mild refresh, it didn’t take long until a full redux was underway. To dull the shine on the Yammie’s frame, everything was stripped out so that a matte finish could be applied. Then deBolex’s Des and Calum figured they’d Cerakote just about everything they could. Blacked out and sinister, attention was now turned to the custom tail. The seat is a single piece of kit that sits on a new subframe structure. And you’ll notice the pillion can be padded or cowled, depending on which piece slides onto the metal racking. 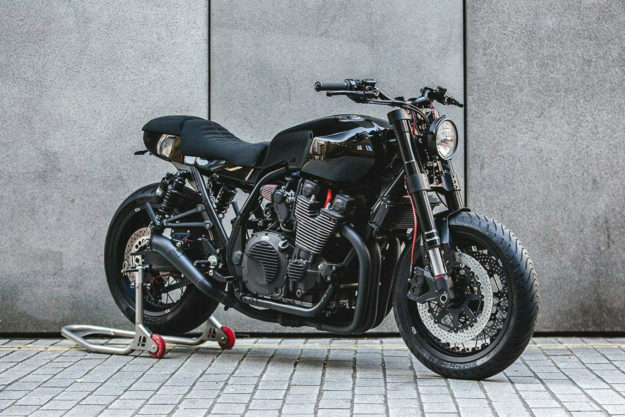 Honda CX500 by Redwood Cycles Putting together your first custom build can be a tricky affair: just ask Chris Kent. Thanks to an ‘off’ and some disastrous electrical gremlins, the bike went through two overhauls—first by Redwood Cycles, then by Smith Brother’s Classic Cycles and Customs. 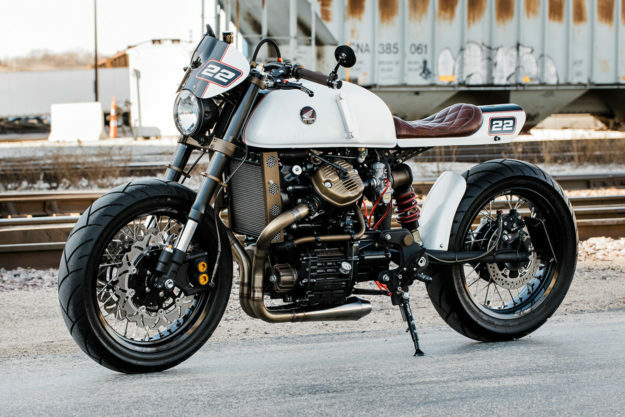 Persistence paid off though, because Obersten Regal (‘Top Shelf’) is one of the sweetest CX500 builds we’ve ever seen. The transverse twin engine has had a complete rebuild—along with an overbore, and the accompanying new, right-sized internals. Mikuni carbs now feed the beast, breathing through a bronzed set of velocity stacks with integrated screening. The exhaust is a bespoke, slinking underbelly unit that exits through a set of 12-inch cones. An R6 surrendered its front end in the name of handling and a Penske shock controls the rear. The Warp 9 wheels came hubbed courtesy of Cognito Moto and are flanked up front by a Gixxer’s petal rotors. 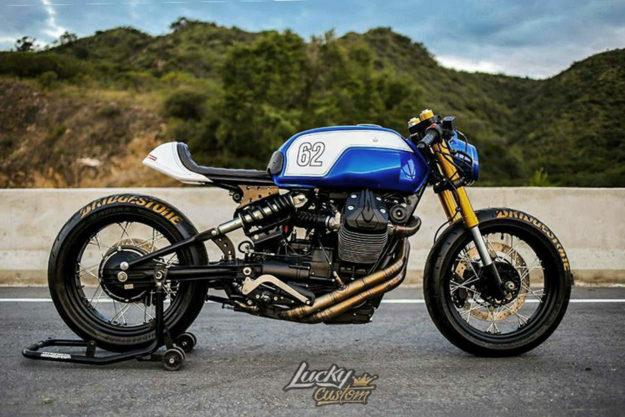 Moto Guzzi V7 by Lucky Custom When a brand spanking new V7 Stone landed on the bench at Argentina’s Lucky Custom garage, they knew a transformation from tourer to racer wouldn’t be easy. And yet they’ve pulled it off and delivered one hell of a looker. 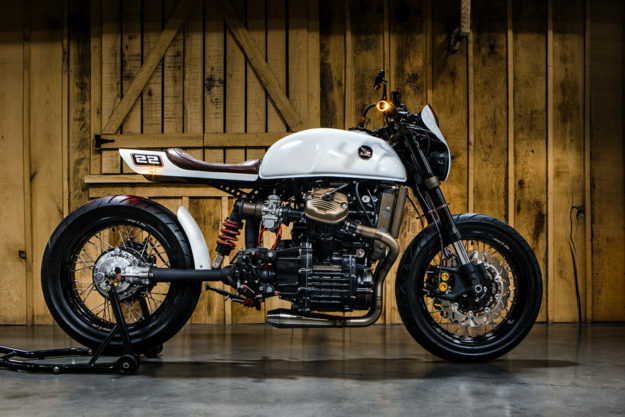 The biggest changes to this ‘modern classic’ Guzzi V7 are the suspenders. For a firmer ride and more confidence through the sweepers, the forks are now fully adjustable units—and the monoshock setup out back is a completely new design. Of course, having that shock run right through the V7’s old airbox and battery tray meant relocating just about everything the Guzzi engineers tried to hide, as well as crafting a new subframe to support a rider. With the stance sorted, the next change was made at the wheels. The hubs at both ends were reworked to accommodate a new lacing pattern and some fatter Bridgestones were spooned on. 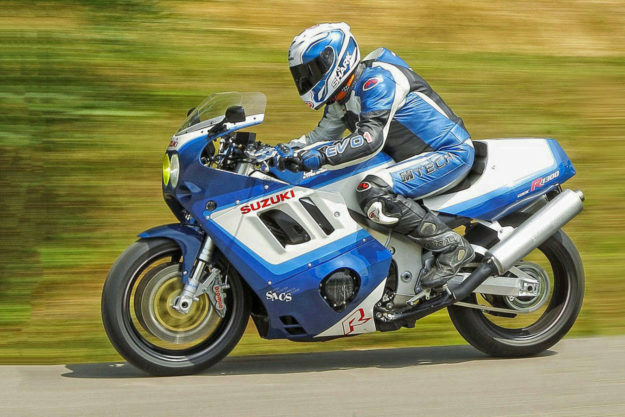 Suzuki Hayabusa by Falk Dirla It’s hard to believe we’ve been tolerating ‘Busa bros and their LED-lit, stretched-swingarm customs for two decades—but lo and behold, the Hayabusa is turning twenty. And while the peregrine falcon-inspired plastics never rocked my world, this retro-tastic reimagining has me feelin’ a touch squidly. 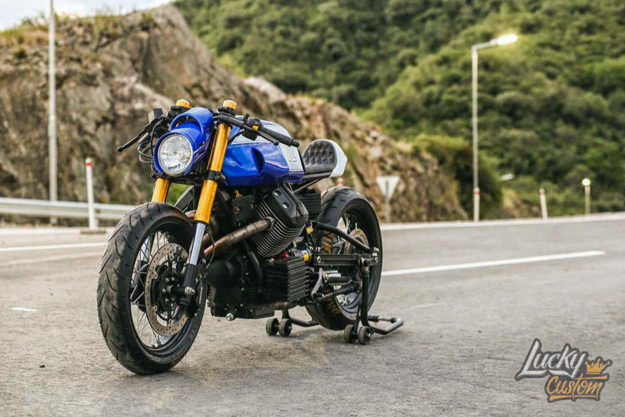 Modeled after a 1989 GSX-R1100, this restomod is a tight and tidy representation of what could have (nay, should have) been. Instead of bulbous bodywork, Falk Dirla worked some magic to deliver slab-sided, late eighties elegance to his once busted ‘Busa. Starting with a stripped and beaten 2000 GSX1300R, Falk put the 175 hp mill on the bench for a rebuild, after a timing problem caused the engine to eat itself a few years back. 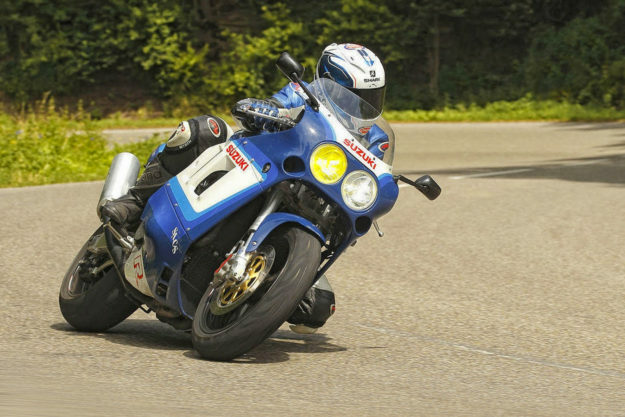 Once it was running smooth and strong, he let his experience as a tuner on air-cooled first generation Gixxers take over.